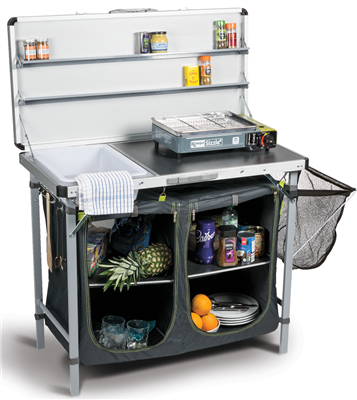 The Kampa Chieftain Field Kitchen is the ultimate field kitchen even including a built in sink and spice shelves.This is an extra large unit with everything you need to cook up a storm in the outdoors while camping, barbecuing, picnicing, attending events or even in the garden at home. Also includes a large hanging larder and waste bin. Folds flat for easy transporting and storage. Includes a strong carry bag. Fantastic product, and great to have zip up shelfing away from little baby hands pulling out cans and rice. Would of been good to have instruction sheet with appliance though as I had all these hooks and not know what to do with them.